A drama about reengaging with life, Manchester By The Sea delves into ordinary lives to seek the private battles raging within. In Boston, Lee Chandler (Casey Affleck) leads a lonely existence as a building caretaker, fixing residents' clogged toilets, shoveling snow and living in a depressing single-room basement unit. Lee is divorced from his wife Randi (Michelle Williams) and has no interests other than getting drunk and instigating fights with random bar patrons. Lee's life is turned upside down when his brother Joe (Kyle Chandler), who lives in the small coastal community of Manchester by the Sea 90 minutes away from Boston, dies from heart disease. Joe appoints Lee as the guardian for Joe's 16 year old son Patrick (Lucas Hedges), and Lee has to fight off his internal demons just to be able to function in his new and unexpected role as the responsible adult in the young man's life. And Patrick has a surprisingly full agenda: two girlfriends, a rock band, and ambitions to follow in his father's footsteps as a fishing boat captain. Matters are further complicated when Patrick reaches out to his estranged mother Elise (Gretchen Mol). Written and directed by Kenneth Lonergan, Manchester By The Sea drinks deeply from the world of broken families, broken dreams and lives drifting sideways. An exploration of personal battles to justify second chances set against the idyllic beauty of a small town by the ocean, the film is an outstanding multiple-character study, with various visible and invisible wounds and scars in various states of bleeding and healing. Lonergan adopts a deliberate but steady pace. The film builds in intensity as the faults in the foundations of Lee's life are gradually revealed, and then the equivalent but different cracks in the lives of all those around him also come to light. Lonergan's masterstroke is in never succumbing to any easy answers or trite moments of sentiment. The relationship between Lee and Patrick remains thorny at best, the uncle and the nephew stumbling over a seemingly endless succession of rub points. Similarly the encounters with Lee ex-wife Randi and Patrick's damaged mother Elise are awkward, full of shame, guilt and unresolved emotions. While none of the characters are happy, misery does not preclude self-awareness, regret and a deep sense of responsibility. Manchester By The Sea is that rare film where adults are locked into emotional prisons of their own making, and they know it. Lee, Randi and Elise are in various stages of making progress towards redemption, an uncertain journey fraught with self-doubt. Meanwhile young Patrick is unknowingly suffering from youth's illusion of indestructibility. He may already be on the path to his own serious mistakes with his casual attitude towards multiple concurrent girlfriends, but his determination in salvaging his father's boat also carries the promise of success built on grit. Casey Affleck delivers a devastatingly affecting performance, carrying the bottled-up agony of a man having to exit his own purgatory to shoulder a new responsibility. 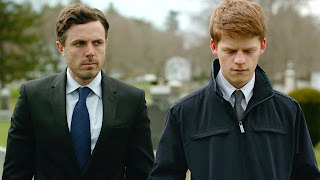 Lucas Hedges is the surprise of the film, benefiting from a screenplay that creates a resilient 16 year old and matching Affleck in the second half of the film. Michelle Williams and Gretchen Mol make strong impressions in small but key roles. Out of seemingly irretrievable wreckage, there are embers of hope. Manchester By The Sea goes looking for glimmers of recovery, and it's a quest both deeply satisfying and sobering in its pragmatism.